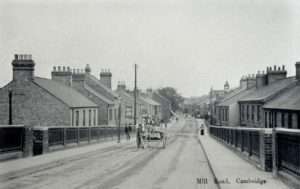 Mill Road Railway Bridge. B.MILL.K1 7603. Courtesy of the Cambridgeshire Collection. Friends of Mill Road History the Mill Road Guides, who are all qualified Green Badge guides, are running two walking tours over New Year. The second tour, on New Year’s Day covers mostly the Romsey side of Mill Road but will venture into Petersfield as well. The tour is £10 on the day (if space available) or £8 if booked in advance at millroadguide@gmail.com. Children under 16 go free. Part of the ticket price goes to support Mill Road History Society in its activities. To join the tour please meet at the corner of Cavendish Road and Mill Road, by the Romsey “R”, before 11am.